Official Viwawa Blog: Wahlords Winter 2009 Finals! The fixtures for Wahlords Winter 2009 are out. 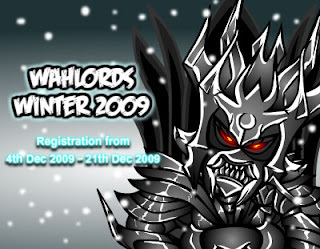 Players like NEED_, LuVNick and gohyizheng are all there, fighting for the top honor of Wahlords Winter 2009 Champion! They will play for the top spot on the 7 January 2010, Thursday, from 2000 hrs to 2300 hrs (+8GMT). We hope all will come and support their favorite players! Viwawa.com seems to be down. I keep getting a HTTP 500 error (cannot display the page) whenever I try to go to it. Yup, but it's fixed now. Problem was due to an update on our servers, but that same problem should not happen again.